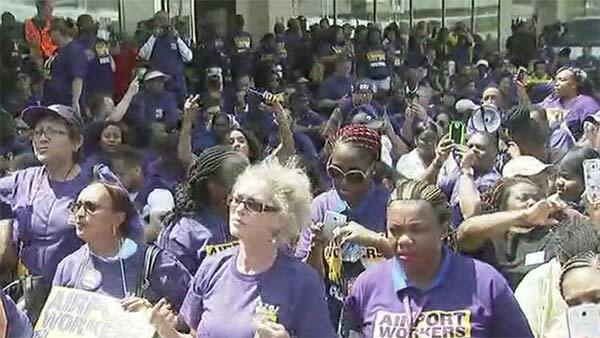 PHILADELPHIA (WPVI) -- A strike that had been planned by contract workers at Philadelphia International Airport has been suspended. Rob Hill, Vice President of 32BJ SEIU, said early Wednesday morning that the union and American Airlines have agreed to last minute discussions. Talks are set for late morning. For now, that means airport workers will be on duty. However, Hill said, they are ready to go on strike "should talks fall apart." Strikes planned for Newark, LaGuardia, and JFK airports were also suspended. Those workers include wheelchair attendants, baggage handlers, skycaps, cabin cleaners, and others employed by American Airlines' contractors Primeflight and Prospect. The group staged protests ahead of the Democratic National Convention last summer. The workers voted to organize into a union and join the 32BJ SEIU, but claim the contractors refuse to negotiate a contract.